New! 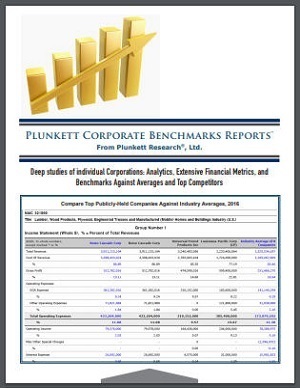 Instant Downloads of Corporate KPIs and Financial Benchmarks - Plunkett Research, Ltd.
Our new Plunkett’s Corporate Benchmarks reports give you key performance indicators and deep financial benchmarks, available on each of our 3,800 major U.S. companies. We add unique value by providing comparisons of a company to its peers and to its industry’s averages. These reports will save you countless hours of research and help you to drill down into vital insights. 1. Comprehensive overview of a company’s financial results, ratios, vital statistics and metrics in one package. 2. Comparisons of deep financials and ratios for your target company to the leading competitors within its primary industry. 3. Historical financial data (multiple years) for the company and its peers. 4. Detailed, multi-year financial averages for all public companies within the industry. 5. U.S. Industry market size for your target company’s business sector, plus historical and forecast CAGR and market revenues. 6. Snapshot profiles of your target company’s top competitors. 7. Rankings of your target company against the top companies within the industry (9 key rankings). Plunkett’s Corporate Benchmarks are perfect tools for consultants, investors, lenders, CFOs and specialists in mergers & acquisitions. Each report is updated annually and runs about 65 pages. Reports are priced at $1,995 for one user, and $4,995 for enterprise-wide use. You can order online at Plunkett Research, or purchase the reports via your favorite market research reseller. This entry was posted in News on March 15, 2018 by NOTadmin.